And that’s how long I want to be your friend! Witty World celebrated Children’s Day with a “ Buddy Saturday” and “Donate a smile” theme on 12thNovember 2016. It was a unique and fun event in which little Wittians got an opportunity to bring their best buddy to school to watch a movie, and donate a toy, book or clothes to a children’s charity. 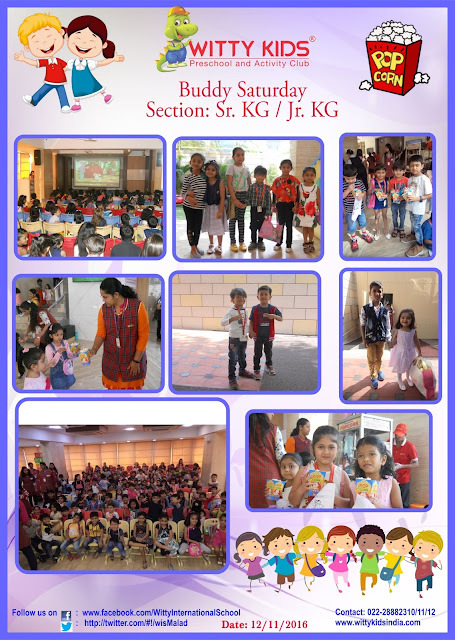 Proud little Wittians were excited to flaunt their school and classrooms to their best friend.A movie celebrating the spirit of friendship with some yummy popcorn to tickle their taste buds, were enough reasons for this special pair to make some wonderful memories together. In keeping with Witty’s theme of experiential learning, the best buddies also got a special experience of understanding the importance of sharing and caring when they donated some gifts, toys and clothes which they will gift on a visit to the orphanage. A lovely takeaway activity will surely be a precious souvenir for the buddies to keep. It was a Saturday well spent with best buddies!